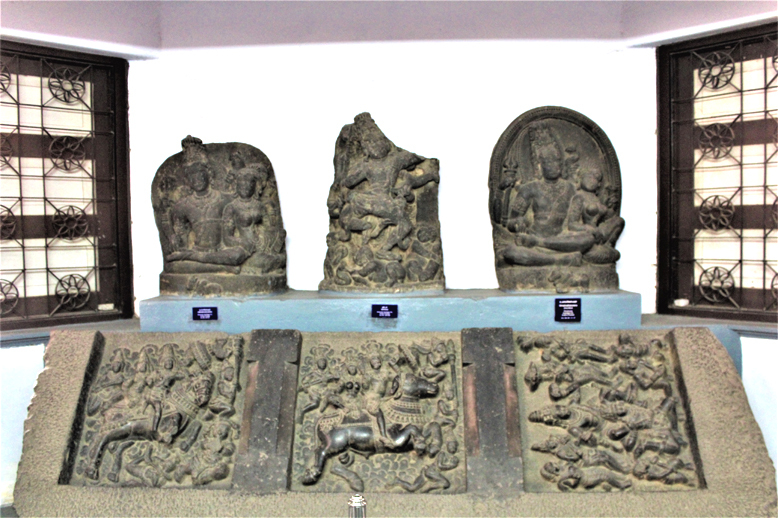 It is perhaps likely that ninety nine percent of the visitors to the Stone Sculpture Gallery of the Madras Museum have never heard of the Nolamba Dynasty. Why blame them when our History text books do not ever mention this name? But those interested in the heritage and culture of India, especially of South India must remember the contributions of this dynasty, particularly to the spheres of architecture and sculpture, which is quite spectacular. The Nolambas ruled from the 8th to the 12th centuries C.E. over an area traditionally called Nolambavadi which extended over south-east Karnataka and parts of Tamil Nadu and Andhra Pradesh. A small section in the Madras Museum is dedicated to the artefacts from select areas under their jurisdiction which belong to 900-1000 A.D. Altogether there are about six carvings which bear the workmanship of the sculptors of the Nolamba era. The most eye-catching is a broken stone slab which has three sections with three sculptures respectively. The plaque placed next to it by the Museum mentions that it is from Hemavati in Anantpur District, Andhra Pradesh. Incidentally, Hemavati was the capital of the Nolambas and this thick slab must have once formed a part of the ceiling of a temple there. These sculptures represent three of the Dikpalakas or guardians of the eight directions popular in sculpture and painting in temples across India and are represented here along with their respective vahanas accompanied by attendants. Two sculptures of Siva and Parvati (Uma Maheshwara), flanking a Nataraja, are seen in this section. 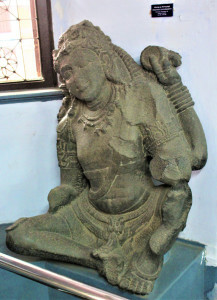 One of these, from Hemavati, Anantpur District, Andhra Pradesh is of Siva seen in a seated posture with the left leg on the right one and depicted with four hands, the upper two holding the trident and a snake. The lower right hand holds a fruit and the left hand encircles Parvati who is seated next to and leaning on Siva. In the left hand this Goddess holds a flower while the right hand rests on Siva’s thigh. While the matted hair of Siva is clearly seen as though it is a crown (jata-makuta), Parvati’s hairstyle is very elaborate. Modern day jewellers could take a cue or two from the exquisite pieces of jewellery such as necklaces, earrings, armlets and bangles which both the deities wear. A small sculpture of Nandi is seen on the pedestal at the base of the sculpture. Another Uma Maheshwara, very similar in execution, is from Penukonda, Anantapur District, Andhra Pradesh. The Nataraja carving in-between the two Uma Maheshwara sculptures is also noteworthy as the sculptor who chiselled obviously wanted it to be different from others of this form of Siva he had seen. Here, the viewer sees the dancer’s back although the face of Nataraja is turned towards them. One foot is on the back of Apasmara purusha, the creature crouched on the pedestal, which has much symbolism attached to it. On either side of the apasmara purusha are two musicians, accompanying Natesha’s dance. Unfortunately the left side of the back slab on which this image is carved has been broken and so are two of Siva’s hands. A sculpture of Vinadhara Dakshinamurti from Hemavai is on display on one side of this small section. Sadly, it is badly mutilated, with three of the four arms and a left leg broken. Even in its damaged state, it is clear that the sculptor had done a remarkably good job of carving an image of the Siva as the deity of knowledge, playing on the vina, although this musical instrument was also damaged and is not seen now. The earnest student of art history will not miss the tilt of the body to the right and the beatific smile, as though the Divine musician is enjoying his own music. Even though this sculpture is much mutilated, the effort of its creator to adorn the deity with various ornaments, each minutely chiselled cannot but be praised. One more Nolamba image in this gallery, also from Hemavati, is that of a well-carved Surya, seen as the Sun God is supposed to be according to the rules of iconography. Standing absolutely straight, this deity’s two arms are now broken but should have once been seen bent at the elbow at waist level and holding the stalks of lotuses in his hands. The mandatory halo around the head is also there but unfortunately the features of the face have been worn smooth, possibly because of weathering. All the sculptures of the Nolambas in the Madras Museum are either slightly or badly mutilated, but clearly reflect the glory of the artistic endeavour of the Nolamba times. Visitors to the gallery need to pay more attention to them.